In November, Birch Aquarium at Scripps opened its newest exhibit, There’s Something About Seahorses. Inside, visitors encounter more than a dozen species of live seahorses and their relatives in various habitats, as well as a seahorse nursery where the tiniest animals grow up. But what exactly does it take to set up and care for so many seahorses? Birch Aquarium Curator Leslee Matsushige takes us behind the scenes. Q. How did aquarists prepare the seahorses for life in their new exhibit? A. We first made sure they were healthy. Were they eating properly? Did they look physically well? Were they behaving normally? In addition, all seahorses obtained from outside sources, such as other aquariums, were put through a quarantine period. They were observed closely and given different types of treatment to prevent disease or parasite problems. We made sure that most of our seahorses were captive-raised because they adjust better to living in an aquarium. It’s also part of our conservation mission to avoid taking animals from the wild when possible. Q. 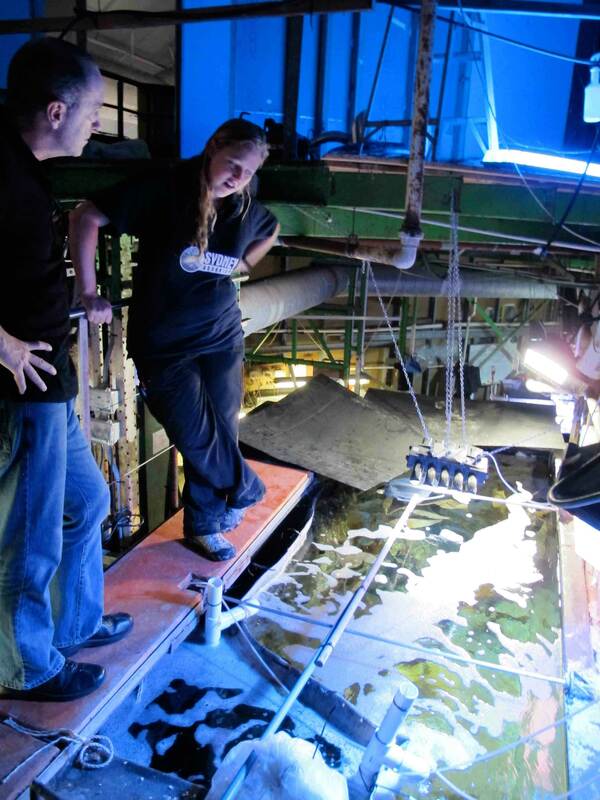 How did the aquarists transfer the seahorses into their new tanks? That seems like a very delicate process! A. We transferred them from their holding tanks in containers filled with seawater, making sure to handle the seahorses as little as possible. We also made sure their new exhibit tank had the same water temperature and water quality as their holding tank, so it wouldn’t be a stressful change. We also wanted the seahorses to feel comfortable in the new tanks, so we designed tanks with proper seahorse habitats. Q. What happened to the dwarf seahorses after they were placed in their new tank? A. They had babies the first night! Dwarf seahorses give birth relatively often, and we had a feeling the male was pregnant when we put him on display because his pouch was larger than the other males. We think it was just a matter of timing; he was going to give birth at that time whether he was in the exhibit or not. 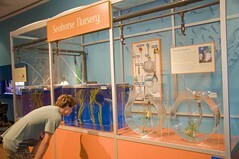 We gathered the babies, and they are now on display within the seahorse nursery inside the exhibit. You can visit them at any time. Q. Speaking of the seahorse nursery, what was involved in setting that up? A. It was set up pretty much the same way as our behind-the-scenes facility. The same seawater flows into both nurseries, and we use tanks with similar designs and shapes. We raise baby seahorses in tanks called “kreisels.” These circular tanks are designed to hold delicate animals such as seahorses and jellyfish. Round tanks provide an even water flow throughout the entire tank so seahorse babies won’t settle on the bottom or float on the surface. 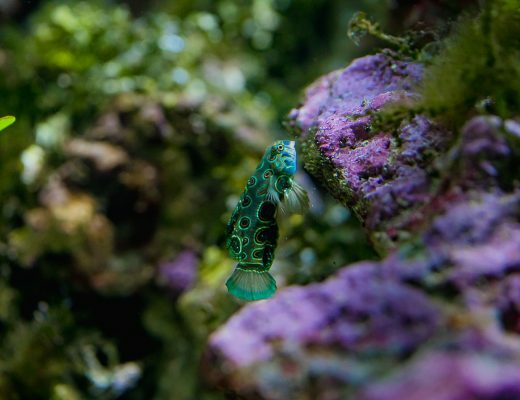 This also means that food is uniform throughout the tank, and hungry seahorses don’t have to work too hard to find a meal. Q. Why is flash photography prohibited in the exhibit? A. These animals can be very delicate, especially the seadragons. When they get stressed, it lowers their resistance, and they become more susceptible to disease or sickness. Flash photography can be stressful, especially if it happens a lot. We appreciate our visitors’ understanding. Q. 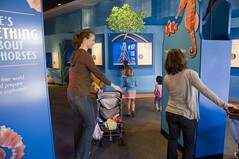 Describe the daily tasks involved in taking care of the seahorses in the exhibit. A. We clean a lot. We’re constantly in the exhibit siphoning the tanks to make sure there is no leftover food or waste. We feed the seahorses twice a day since their metabolism is faster than other fish. But after you feed, you have to clean again. However, a lot of critical observation occurs during these tasks. That’s how we determine if the seahorses are healthy. If their behavior is odd, it’s a clue that something could be wrong. Q. What do they eat? A. It depends on the size of the seahorse. Usually smaller seahorses eat larval brine shrimp or a type of amphipod. Bigger seahorses are fed mysis shrimp, which can be cut up or eaten whole. The largest of these shrimp is only about half an inch. Q. Have you noticed any interesting behavior from any of the species? A. They sometimes hang on to each other. A lot of visitors find this really cute because it looks like they are holding tails. Some seahorses grasp on to the airline in the tanks that provide aeration. They stay right in the bubbles, bouncing around, but don’t let go. It seems they like it. Maybe it feels like a massage. Or maybe the bubbles help slough off something on their skin. birth. It’s possible to witness this in the new exhibit, but you never know when it’s going to happen. You just have to be really lucky! Q. Have you heard any interesting comments or questions from visitors? 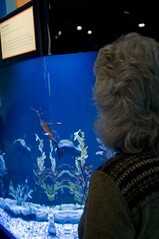 A visitor checks out the weedy seadragon. A. A lot of visitors are surprised at how small seahorses are. Images sometimes suggest these animals are larger, maybe even rideable. Visitors are astounded to learn that seahorses are fish, because they look so different from a typical fish. They also don’t realize how well seahorses can camouflage themselves to match their surroundings. Sometimes several seahorses in the same tank look different, even though they are the same species. In general, our visitors are captivated by seahorses, just like we are. They are almost a fantasy animal, like a unicorn. There are so many things about seahorses that make them interesting. Q. Do you have any favorite tanks? A. Definitely the leafy and weedy seadragons, for sure. But, truthfully, all of the tanks have their interesting things. For example, sometimes the potbellied seahorses puff out their pouches so big that they look like balloons. It’s amazing! I also love watching the little babies grow. It’s one of the most exciting things for the staff to witness.